When shopping for software to develop your eLearning content, it is important to get the right tool for the job. Today we’re looking at TechSmith’s Camtasia, a screen and audio capturing software. While other eLearning software platforms like Articulate Storyline, and Adobe Captivate also have screen capture capabilities, you may be asking yourself if what they have is robust enough for what you need to accomplish. Here we will examine Camtasia’s unique strengths and limitations as an eLearning tool. Camtasia is a full-featured screen and audio capturing and editing software with additional limited interactive quizzing capabilities. It can be bought by itself as Camtasia Studio, or a limited version of it comes bundled with the Lectora. 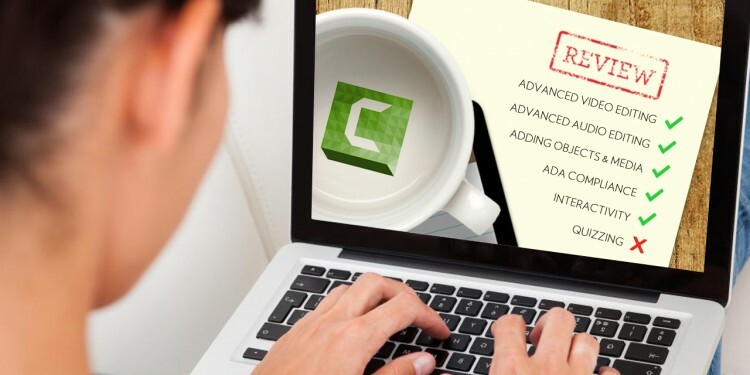 Because Camtasia is specifically a screen capture production tool it can’t really be compared to the limited screen capturing capabilities of other eLearning Software platforms because it has many more advanced features. As a video editor, it could be compared instead to software like After Effects or Adobe Premiere. But for our purposes, let’s look at what its strengths and limitations are as an eLearning Tool and whether it fits your needs. Advanced Video Editing – Editing your project after the initial recording is Camtasia’s strongest suit. Once recorded, video sections can be split, cut and pasted and moved around easily. The audio appears on a separate track and can be manipulated separately. There are also many ways to enhance the animation of mouse movement by adding highlight circles, effects on click, magnification and spotlighting. Advanced Audio Editing – Removing room noise, leveling clips, and doing voice over after the screen recording is captured are all possible with Camtasia. Adding Objects and other Media – The video and audio are only part of a Camtasia project. You also have the ability to add built-in callout areas, extra graphics like logos, sound effects, and images, something that can come in handy if you want to go back and replace a graphic or cover something up without re-recording. 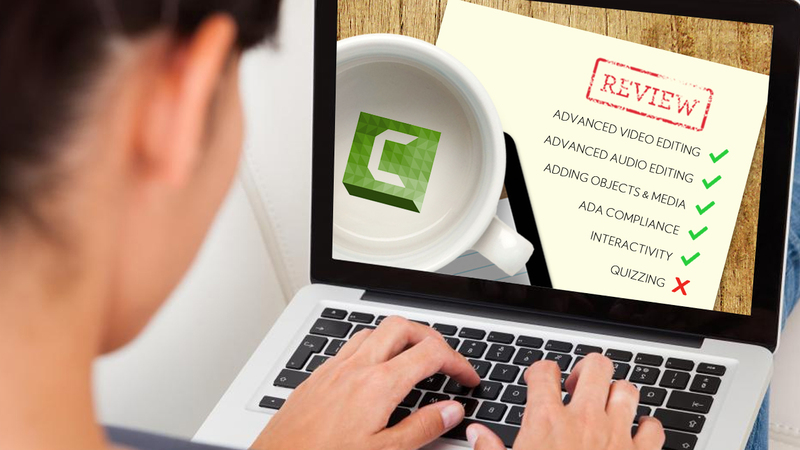 ADA Compliance – There are three ways to create closed captions in Camtasia. Its speech-to-text feature can create captions in real time as you record, you can sync text from a written script and have it show on screen, or you can write in captions manually. Quizzing – While Camtasia does have the ability to add SCORM compliant quizzes, this is a very limited feature. There are only 4 types of questions to choose from and no real flexibility for custom functionality, custom logic or variables. Interactivity –Camtasia is solely a screen and audio capture tool and not a tool specifically for interactive eLearning. Although there is a table of contents option for users to access different sections or videos, users do not interact directly with the program nor can there be branching logic in the navigation system as is possible with Lectora, Captivate or Storyline. If your eLearning is heavily quiz-based and interactive, your best tool would be a full eLearning software package like Lectora, Captivate or Storyline. If you are working mostly with software simulation, screen capture or are working under tight ADA compliance, Camtasia Studio is a good choice to make. How much does it cost for industrial eLearning production?